These days, a splash of colour has been added to the view from the railing around the central staircase at Moesgaard Museum. 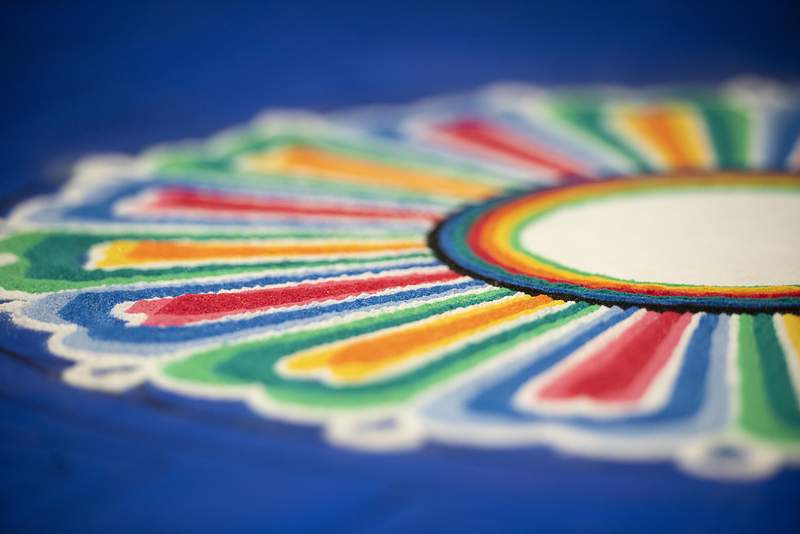 Looking down, our visitors will be met with the splendid colours and intricate details of a Buddhist sand mandala. 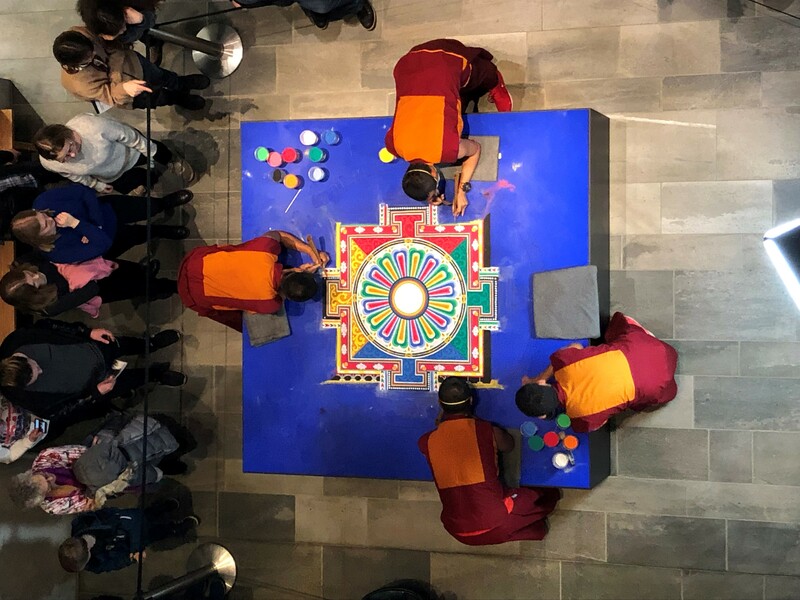 During a week in February, we were lucky enough to play host to four lamas from Pema Ts’al Monastic Institute who spent their days in Denmark creating the sand mandala, as the museum’s guests watched with great interest. There are many kinds of sand mandalas, but the one you can now see at Moesgaard Museum is ‘The Buddha and the 16 Arhats’. Arhats are like saints, who spread the Buddha’s teachings after he died. And as we look at the finished mandala now, we should visualise the Buddha sitting in the white circle in the middle. 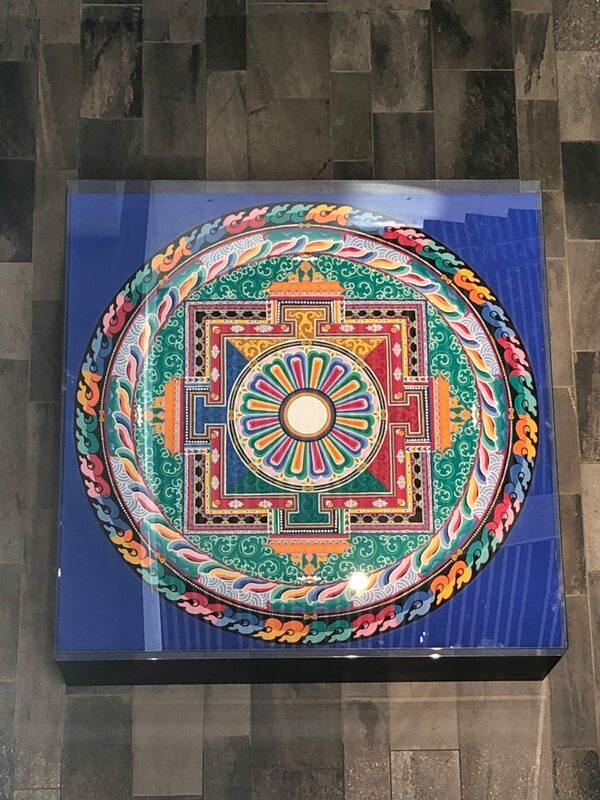 Even within the different motives of sand mandalas, there are variations according the preferences and artistic expression of the lamas making them; the details on Moesgaard’s sand mandala are very intricate and highly detailed. This is because Lama Lhekshey felt that, as it would be exhibited at the museum for three months, we should have an extra beautiful and intricate version. The mandala is part of a special exhibition called Museum of Impermanence. Through cases from Nepal, Papua New Guinea, and Tibet, the exhibition explores the notion that nothing lasts forever, and how people in these three different settings deal with this fact. That nothing lasts forever, is truly exemplified in the sand mandala. The four lamas spent a week constructing it, often standing or sitting, in deep concentration, bent in awkward angles. The work takes place in stages, and once the lamas begin a stage, they cannot stop until it is finished. Doing so would leave the mandala vulnerable to attack from negative forces. Once all this hard work is done, the mandala is dismantled, and the sand, and the blessings and good wishes, which the lamas have imbibed it with, is disposed of in a body of water, allowing these blessings to flow out and affect the wider world. 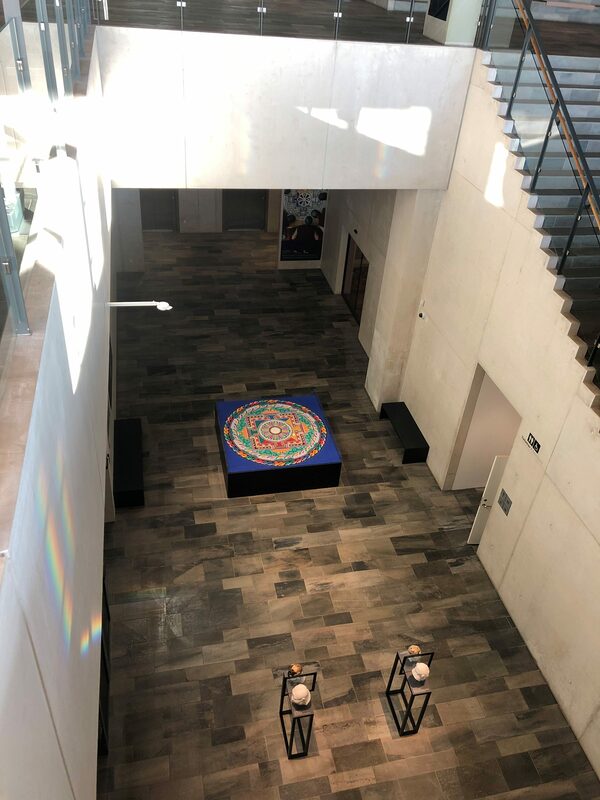 That you would immediately destroy something so beautiful can seem jarring to many Danish museum goers, but the impermanent nature of the mandala is itself key; it symbolises the transitory nature of life itself. But the Moesgaard sand mandala has been ‘paused’. Instead of dismantling it immediately, as is the norm, a display case has been placed over it, so that all our visitors can come and see it. However, they have to hurry, because the sand mandala is indeed an impermanent artefact. 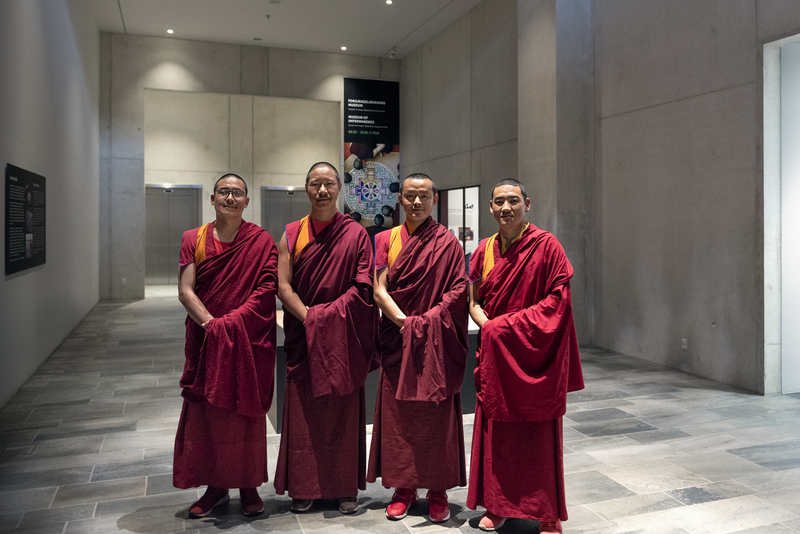 On May 19th, two of the lamas from Pema Ts’al, Khenpo Jampa and Lama Tashi, will return to Moesgaard to remove the mandala. This will also be open to the public, so keep an eye on Moesgaard’s website for further details.